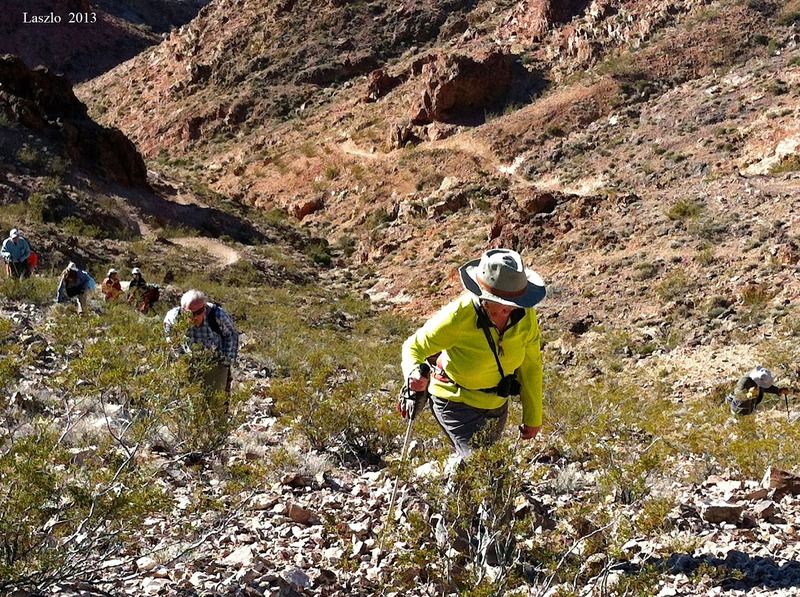 As a hiking club based in Las Vegas, Nevada, we are a group of young-at-heart people age 50 and over who participate in outdoor activities. We welcome adult guests from anywhere in the world. 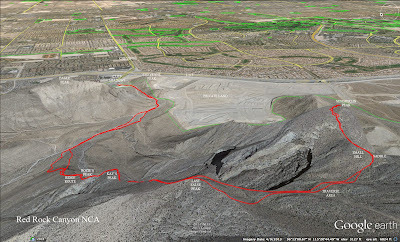 To end Year 2013 with a bang, Mike OC coordinated our yearly hike to Summerlin Peak. 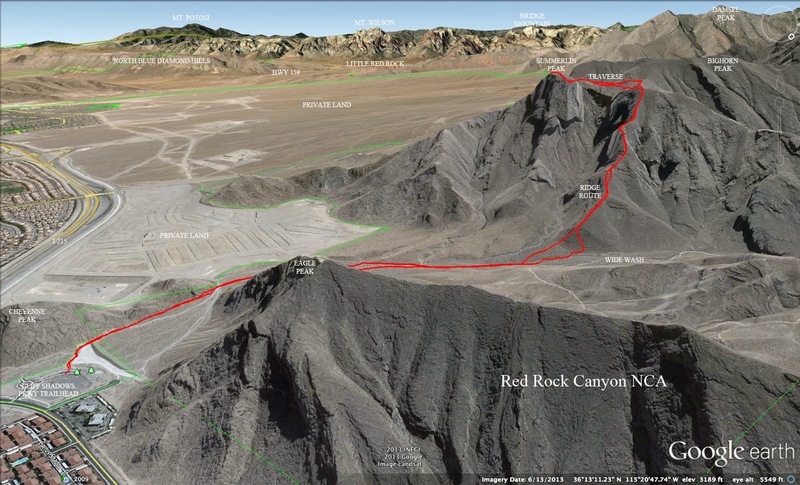 This peak is located within the Red Rock Canyon NCA bounds just outside the northwest section of the city of Las Vegas. 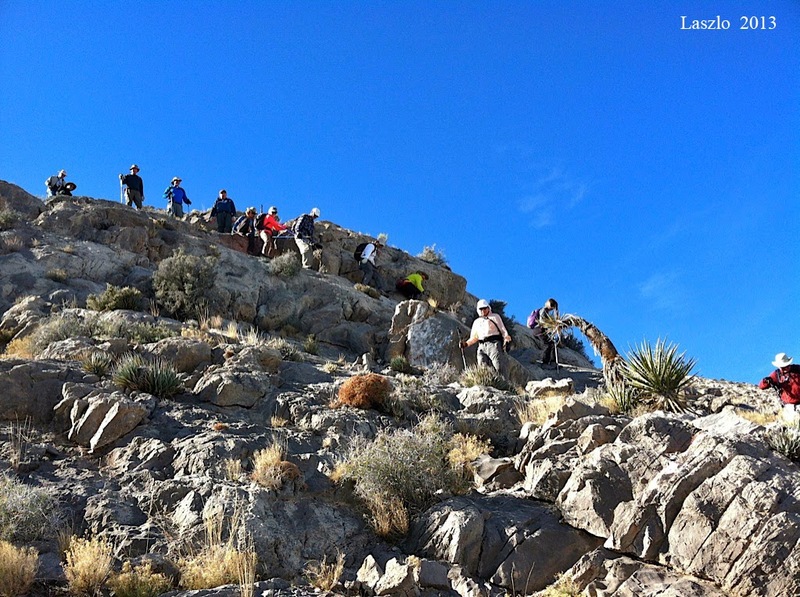 Fourteen hikers met at the trailhead that was located off of Cliff Shadows Parkway very close to I-215 and Cheyenne. We were all in good spirits as we started out the wash between Eagle Peak and Cheyenne Peak. 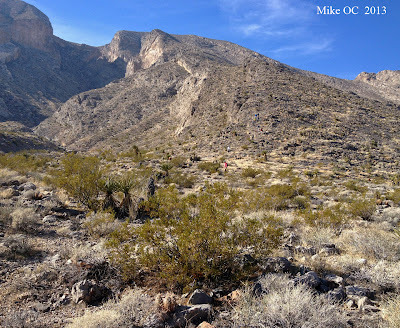 (Note: There was a small homeless camp in a cave next to the wash.) After about a mile, we separated into two groups. The larger group turned off to the left on the old road/trail that leads up the route that John Snail showed us two years ago. 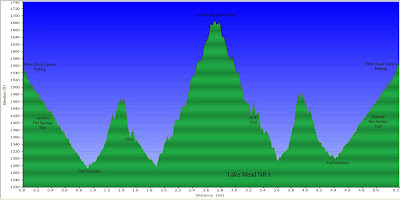 This is a very very steep route. 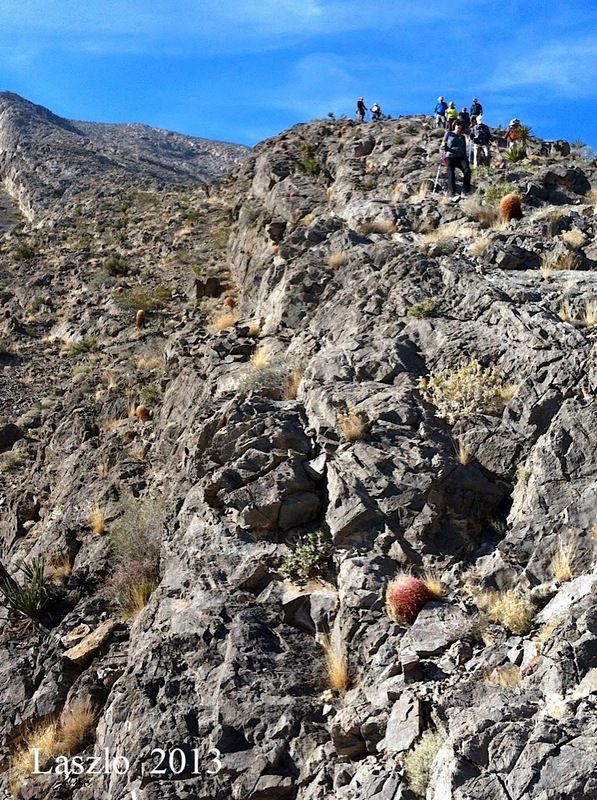 The smaller group of four hikers, hiked on up the wash a little further then turned to the left to climb up a ridge that would take us all the way to the top. This is only a very steep route! The two groups merged at the first false peak saddle. 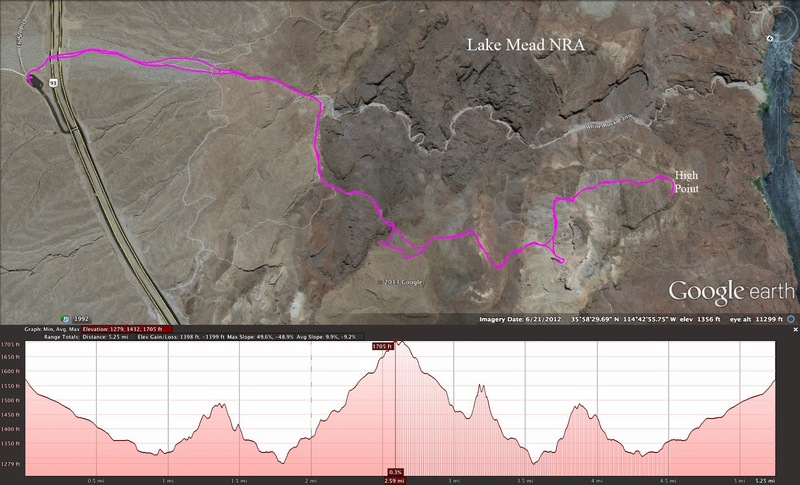 After arriving at pretty much the same time, we concluded that the easier but longer ridge route and JS's steeper but shorter route timed out about the same. Nevertheless, we were all warmed up and starting to feel what kind of toll this hike would take on our energy supplies. (Summerlin Peak is a steep #@$%##@$!) Our next points of interest were the following two false peaks that we dubbed Rozie's Peak and Kay's Peak since these were the places where Rozie and Kay seriously considered calling it a day! 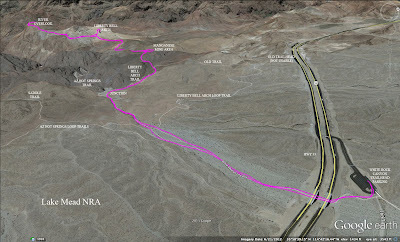 It was after the fourth false peak that anywhere will do to begin the traverse hike around and to the left to the Summerlin Peak area. We realized this a little late and, again, the group split into 3 or 4 smaller groups. Each group traversed at a different level. 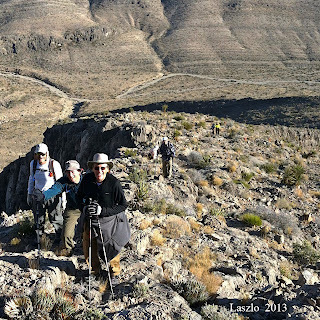 The traverse hike took us around an indentation between ridges. 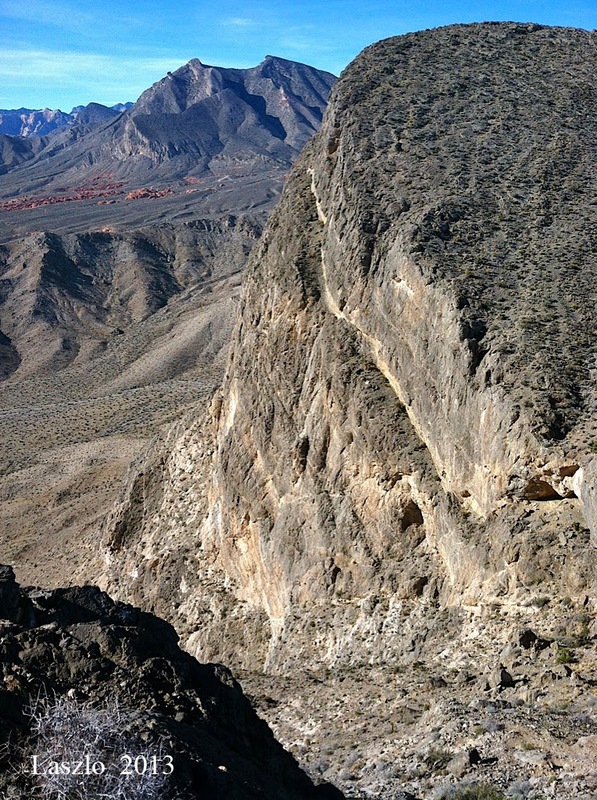 Below us was a steep cliff area that fell into the rugged canyon below the peak. If you position yourself correctly during the traverse, you will arrive near the saddle to the right of a small hill next to the peak. This keeps you from having to either climb more or lose too much altitude during the crossover. 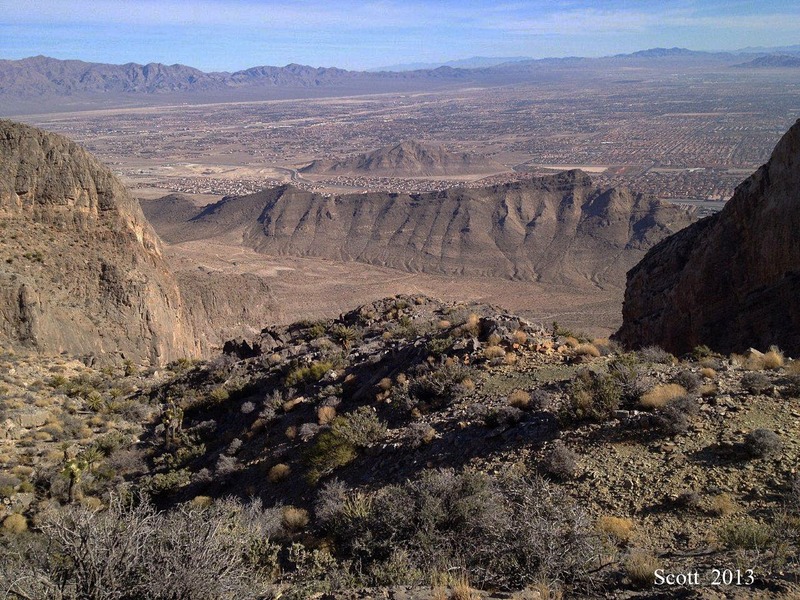 The view from Summerlin Peak is unique. Since it is not near any other peaks that we climb, it offers several views not seen from anywhere else. 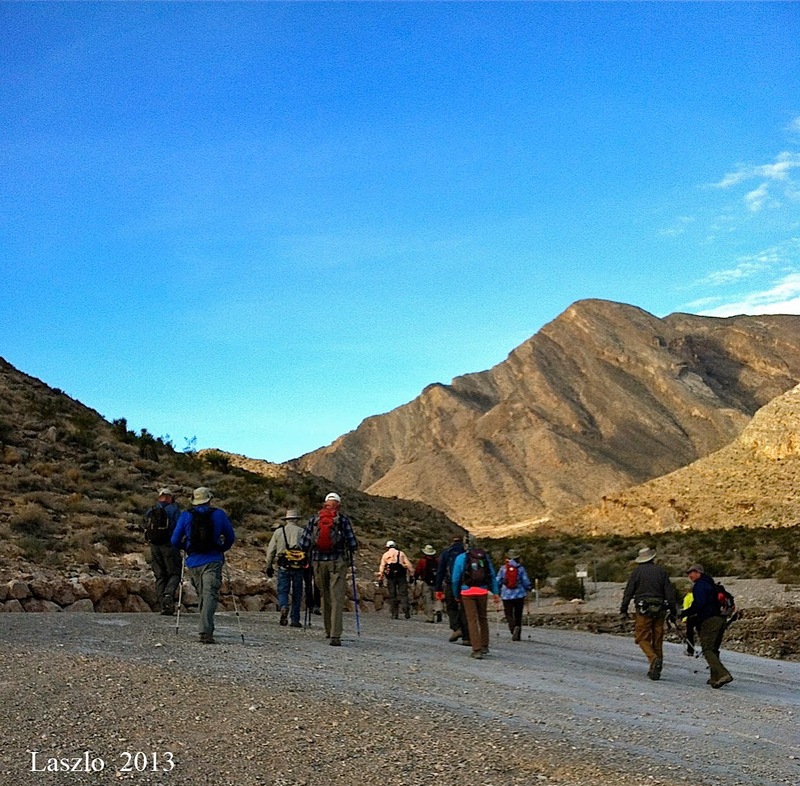 Sixteen hikers came out for a predicted warm day's hike to Liberty Bell Arch in the Lake Mead NRA. They got a cool overcast morning! Although most of us were a little under-dressed for the occasion, we did eventually warm up with the exercise. We drove out to the White Rock Canyon Trailhead parking lot found near mile marker 4 on Highway 93 in Arizona just over the Hoover Dam bridge. We all made sure that we had no valuables left in our cars due to occasional window breakage at this location. Then we started out down the wide wash under the highway bridge. This is also the beginning of the Arizona Hot Springs Trail. 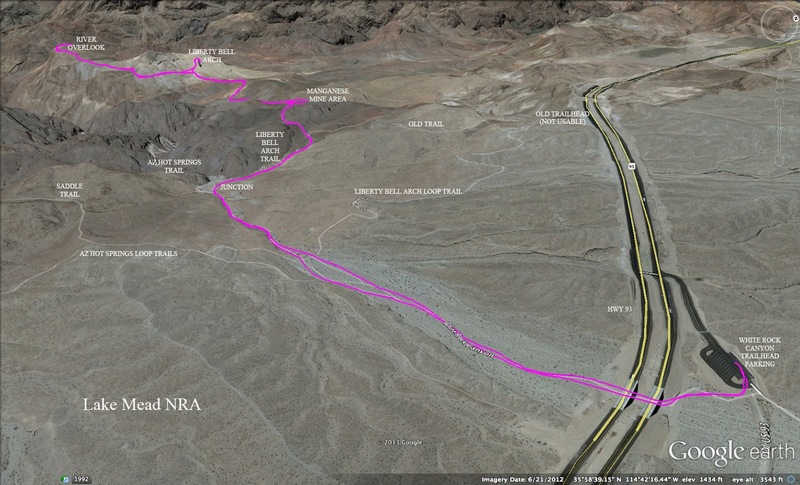 We followed the official hot springs wash trail for approximately 0.9 miles. At the Liberty Bell Arch Trail junction, there is often an arrow in the gravel pointing to the right turn. 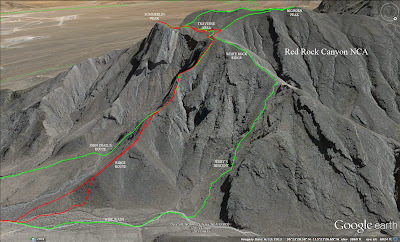 If there isn't, look for a trail leading gently up through a wash just past a sandstone wall to the right. This trail takes the hiker up through a wash with a layer of yellow and then a layer of white rock. 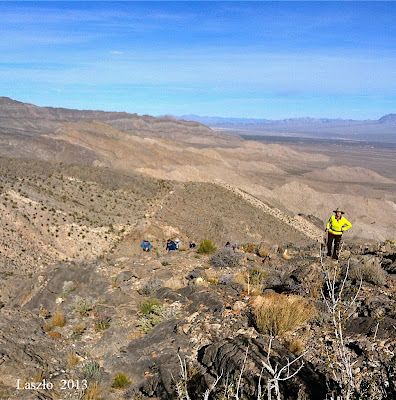 Eric, a geologist in our group, suggested that this area may have once been a hot springs area due to the rock colors. Interesting. He also noted that there are many granite boulders in the White Rock Canyon. These boulders, being largely out of place, probably made their way down to the canyon from mountains in the distance. Still, the abundance of volcanic rock in the area makes him wonder where exactly did the granite come from? Interesting, again. We passed the old mine sled and dropped down to the ruins of the old manganese mine below. Checking out the inside of the mine, we found old rusted buckets, wood and train rails. After leaving the mine, we followed the wash down to a junction where the trail led up to the right. We could already see the side of the Liberty Bell Arch above. The trail would lead us up to an area just below the arch. The best place to view the arch is on up the trail past the arch. It is here that you can clearly see the "Liberty Bell" shape. You can also see part of the Hoover Dam bridge in the distance to the right of the arch. Today's cloudy skies gave the desert a different appearance. Not necessarily bad. Just different. Colorful in a monochrome sort of way! However, the red barrel cacti were spots of bright red. Usually, these cacti are redder after a rain. Another sign of recent rain was the plumpness of the beaver tail cacti. Many of these opuntias had bites taken out of their leaves. Tortoises enjoy this delicacy! 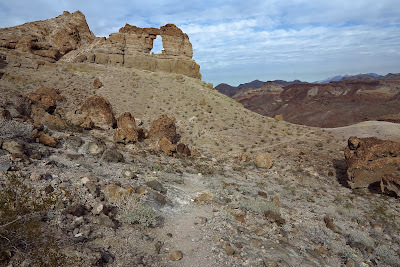 After passing the arch, we continued up to the plateau above where we could overlook the Colorado River and Black Rock Canyon while we took our break. Below us, we saw kayakers cruising the river and campers enjoying a nice little river beach cove. Not a single bighorn sheep around - a little unusual for this area. Bald eagles also live here but we didn't see any of those either. At the end of the trail, there is a larger view of the bridge up river. Most of us chose to stay on the down river end of the plateau. After enjoying a few minutes at the overlook, around half of the hikers decided to return to the arch for a side trip. The hike up to the inside of the arch isn't for just anyone! There is a steep slippery hill under the arch, a rocky slippery climb next to the arch and a balancing act on a four inch ledge with exposure involved in reaching the inside of the bell. Six hikers made it! (Side note: Hikers used to go to the top of the arch. It is now considered unsafe. Crumbly, in fact.) 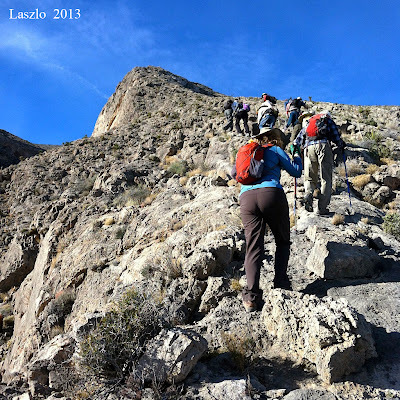 Photos were taken from below then the group started the arduous down climb over the steep terrain. During this time, the remaining hikers left the overlook and a few hikers began the return to the cars. Five hikers were ahead of the crowd. Then the last group of hikers arrived at the arch as the first group of hikers made it back down to the trail. 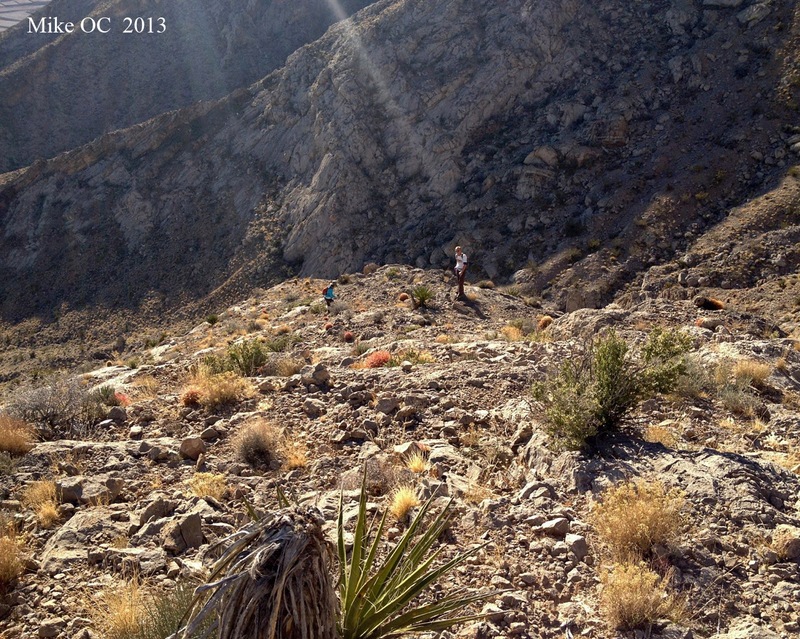 Being in the lead group, the writer took the photo of the eleven hikers coming down off of the arch hill below. 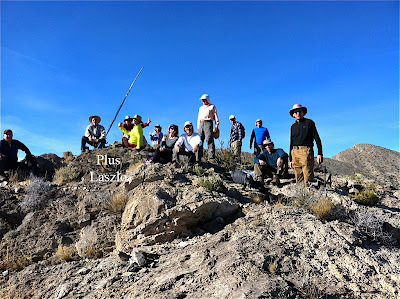 Since we had plenty of time to go slow and enjoy the hike, Eric took us to school on a little geology. 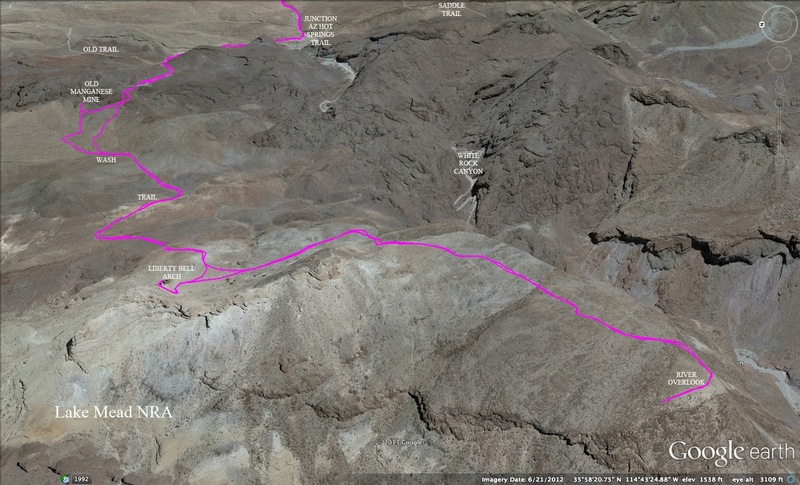 By the time we finished today's hike up and around Red and Black Mountains, there were fourteen hikers. 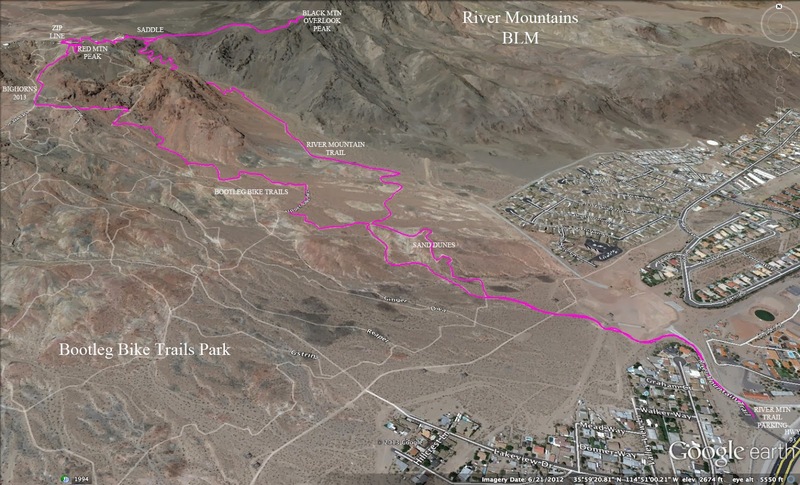 Six hikers gathered at the scheduled meeting place, six hikers joined them at the trailhead and two more hikers met up with us on Red Mountain Peak! We parked at the River Mountains Trailhead found off of Highway 93 in Boulder City, Nevada and began hiking the trail up into the colorful area above. We turned left onto the Upper Lake View Trails then left onto a bike trail called Ona Lee. Ona Lee became steep and rocky and we wondered who on earth would ever ride a bike here! We were treated with a couple of bighorn sheep sightings from the area below the zip line. 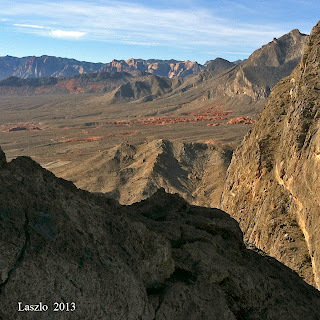 First, two males came running across the trail and below us to disappear up the red rock in the next canyon. Soon after that, we saw two females standing on a sloped ridge just watching us. We decided they must have felt very safe because they didn't leave even though they were clearly in silhouette on the ridge. 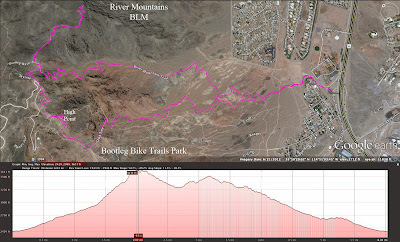 Next, we turned right onto Snakeback Trail, a trail that switchbacks up toward Red Mountain Peak. Straight above us was the first segment of the zip line and we were lucky to see a large group of zippers just arriving. With great fanfare, the worker bees zipped by above us. We were pretty sure, after that, that they enjoyed their job! There were two hikers already up at the peak base. We realized quickly that we knew them! Laszlo and Rozie had missed the meeting point and came late to the party. We were now fourteen hikers. As we finished climbing up the hill, the zippers started getting their big speech. 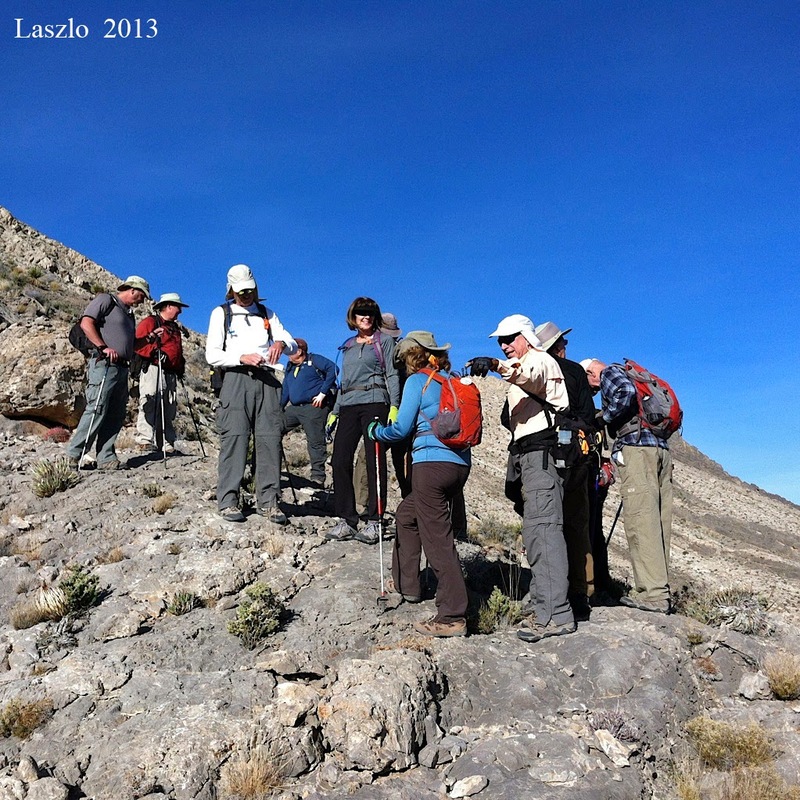 Most of the hikers stayed to listen while four hikers summitted Red Mountain. It was pretty breezy up there and few hikers wanted to feel the windy bite. Another show on tap for today involved two mountain bikers. 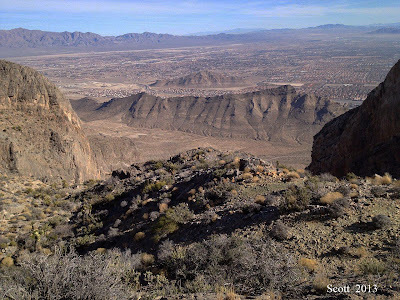 We watched amazed as the two bikers rode down the Sidewinder and Snakeback Trails. (Ah, to be young and easily mended again!) After all the zippers unzipped, we began our hike down to the zip line parking lot. From there, another couple of switchbacks down took us to the saddle between Red and Black Mountains. 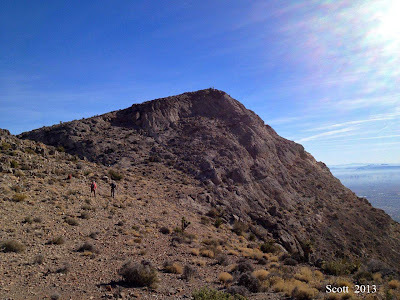 With no further ado, we started up the Black Mountain Overlook Peak Trail. To our left, we saw a beautiful view of Las Vegas and the Spring Mountains. A snow-capped Mt. Charleston topped out the picture. We hiked up the gentle climb enjoying the day now that we were out of the cold wind. At the peak, we saw that someone has replaced the informational sign that was there before with another sign. This time, geologic layers of various Vegas faults are named. We stayed here for a little while taking our break and looking out to Las Vegas, Lake Mead, Boulder City and the neighboring real Black Mountain Peak. Too soon, it was time to return to real life! 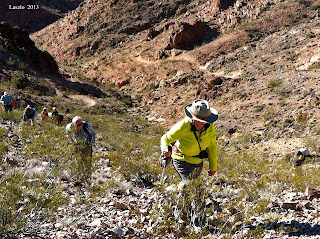 We returned to the saddle and continued down the River Mountains Trail. 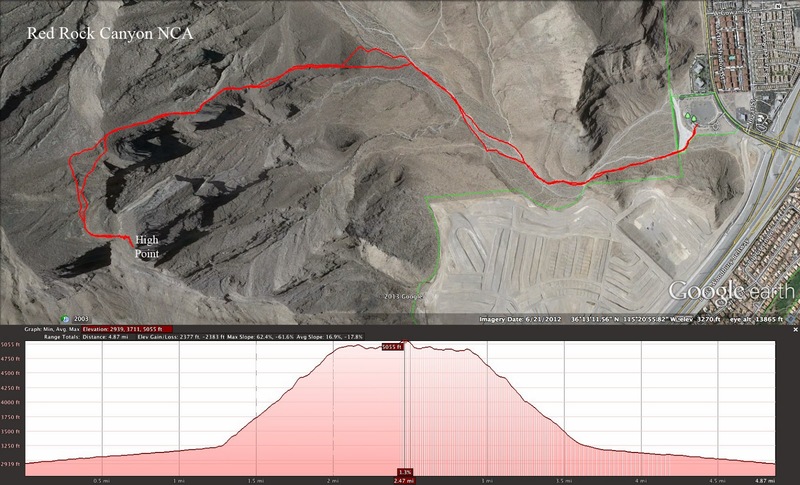 First, there were a lot of switchbacks, then it was a long straight hike out of the canyon. When we reached the bike trail area, we opted to hike through the windy ancient sand dune trails. Statistics for today: 6.3 miles; 1600 feet of total elevation gain; and, 3.5 hours. As a group of people who have climbed over the age 50 mark and still have very young hearts (pun intended), we welcome new members and guests to our club. It is easy to join. Just show up at a hike rated easy or easy moderate and pay your yearly dues of $10. 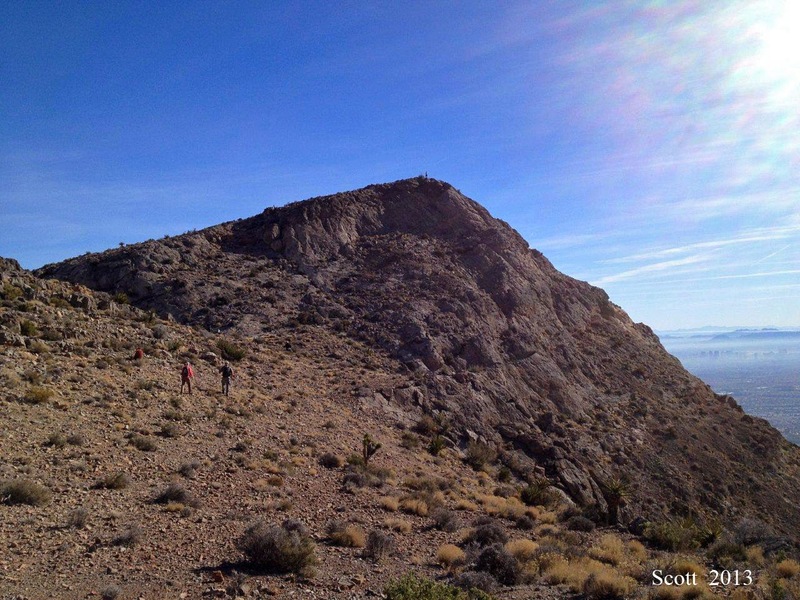 If you aren't sure about it, be our guest for one hike. You will be required to sign a waiver of liability and a release of your image to be used on this website if you happen to walk inadvertently in front of a camera. For more information, email John Ward at wardjohn1948@yahoo.com. 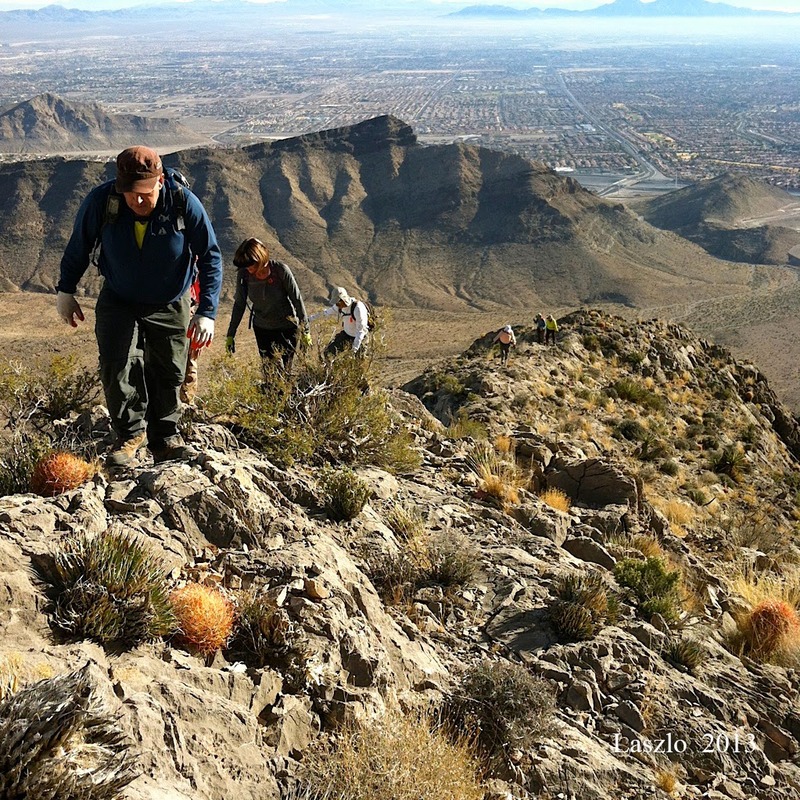 Hike Coordinators have the right to refuse a hiker for any reason. If you packed it in, then pack it out. Come prepared with proper clothing & shoes, water, nourishment, hiking sticks & gloves (if needed). Sign in on every hike ... and don't forget to sign out at the end! Either stay with the group or notify coordinator of your change in plans. The AtBF hike coordinator only makes suggestions. The rest is up to your good judgment. Carry ID and emergency info. Name tag wearing is also encouraged. We love them but service dogs only ... sorry. Please keep in mind, many of our hikes are not dog-friendly. To the extent that we contemplate ourselves and elevate our state of life, we can deepen our understanding of others. Someone who does so is capable of recognizing and treasuring people’s individuality. A person of wisdom tries to invigorate others and bring out the best in them. I believe friendship is the most genuinely humane relationship of which we are capable. To be understood and appreciated for oneself is a vital experience in life. Dogs solution for stress: if you cannot eat it, if you cannot play with it, pee on it and walk away.